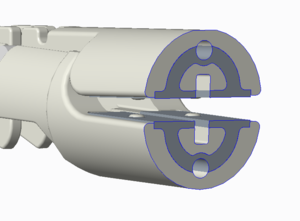 The goal of the case study development in this project “individualized gripper minimally invasive surgery” is to bring focus on the potential of AM of ceramics within the surgical field. Both to surgeons, instrument designers and manufacturers it could kick-start a synergetic development of this technology. 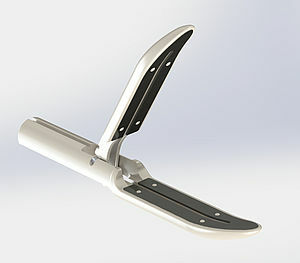 The demonstrator for this specific case study is a gripper and bi-polar ligator used within minimally invasive surgery. MIS surgery takes place through small incisions in the body, giving the need for special instruments that can go through the small holes and help perform the needed functions during surgery. This gripper and ligator can hold, burn and cut tissue and blood vessels with the use of gripping jaws, electrodes and current, and a knife. Many surgical procedures have evolved to be performed laparoscopically instead of by open surgery, which has several benefits. Before any procedure, unless in an emergency, a surgeon will plan which tools and instruments should be used for the specific operation. During this planning, the surgeon will also choose his preferred instruments. The range of available instruments depends on many factors. The surgeons skill level, ergonomics, what is in stock, who is in charge of purchasing instruments, how updated is the current technology, what is the budget for instruments, etc. From the manufacturers point of view each surgeon’s individual needs regarding choice of tools and instruments result in added product portfolio complexity, and more complex tooling, assembly lines, part numbers etc. and therefore increased costs of production. During the planning period, novel manufacturing with 3D printing and a service system could provide the surgeon with custom instruments made specifically for her needs and empowering her technical skills. This could possibly also lower the costs of production of medical tools and instruments. Using the benefits of AM such as design flexibility, construction possibilities and technical ceramics we have managed to reduce the number of parts of the multi-functional gripper from seven to three, and to reduce number of used manufacturing methods from six to two. The gripper has electrodes to coagulate blood. These will now be printed with the ceramics instead of steel. We need cables to attach to the conductive printed parts. To ensure electrical transmission between cables and electrodes, a channel of conductive ceramic material that connects those two has been integrated in the centre of the original upper- and lower jaw designs. The planning of a service eco system has begun and interviews with surgeons, hospitals and purchasing departments have been done in order to know how to fulfil the needs from different stakeholders along the value chain and to substantiate the case. Also, the feedback gives valuable information for further developing the case study product. These products are under development and are not approved by any authority.